1. What is the animal sticking its neck out of the crown? It's not a serpent, not a giraffe and not a llama, though it bears characteristics of all three. 2. My other question is the Coat of Arms the same as what the Sinclair Family Crest would be, or would that be something entirely different? If so, can anyone point me to an illustration of that? I appreciate any input on this. I'm currently working on a story where this factors in, and I wish to keep it as factual as possible. Have you got a postable photo of that? I tried to look one up with no luck. The depiction of the Arms shows a shield with a Templar-like cross emblem stretching across the surface of the shield. On the top right of the shield is what appears to be a crowned helm of some sort, with the elongated neck of an animal rising out of the crown. Is that it? It looks like what Proc described. badinfluence63 wrote: Is that it? It should be. It's what Google came up with when I searched 'coat of arms Earl of Orkney' under the 'images' section. Then that is the funkiest looking coat of arms I've ever seen. I can't imagine the meaning of it . That's the one! And that is most definintely the weirdest coat of arms I've run across. Yet, that's what Finnan has in his book. Any ideas as to what the critter in question is? I'm thinking that since Sinclair was Scottish, maybe it's the Loch Ness Monster! I think it represents the demons in his head that causes him to do some of the wild and crazy things he done. Or it was a vision he incurred after inadvertantly ingesting shroommage. maybe it's the Loch Ness Monster! You know, that was the first thought to cross my mind when I saw the coat of arms. And I agree, it's one of the strangest arms I've seen. I couldn't begin to fathom the meaning of it, but maybe some hunting around the 'net will clear it up. 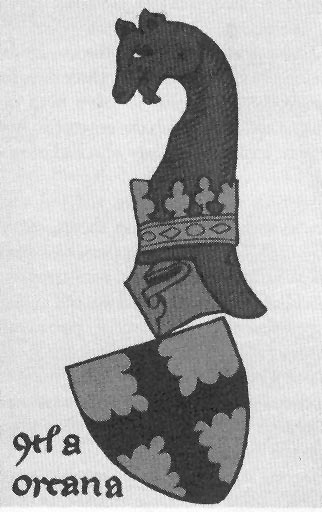 Apparently, this is an 'early' Sinclair coat of arms, and if I understood what I read correctly, it would date somewhere in the region of late 13th c. - early 14th c. I wonder why they changed it to the one I posted above?